You are at:Home»January»January 27»January 27, 98 AD: Who Was the Greatest Roman Emperor? January 27, 98 AD: Who Was the Greatest Roman Emperor? On January 27, 98 AD, Trajan became Emperor of Rome, succeeding his (adoptive) father Nerva as Emperor. Trajan ruled until his death in 117, a time when Rome saw its greatest military and territorial success. Many readers may immediately think of Gaius Julius Caesar when the subject of “greatest Roman emperors” comes up, but in fact, Julius Caesar was not emperor, as that office did not exist at that time. The first person to be considered Emperor of Rome was Augustus, the great nephew (and adopted son) of Julius Caesar. Born Gaius Octavius, Augustus was named by Julius Caesar as his heir, but when Julius was assassinated in 44 BC there was a time of disruption and war amongst Romans in a struggle for power. Octavius/Augustus came out on top after a series of several years of warfare and consolidating power. The lineage of Roman emperors started with Augustus, although it is not totally unfair to consider Julius Caesar as emperor in all but official title. Trajan was born in what is now Spain in 53 AD, leading some of his Roman critics to claim that Trajan was not really a Roman or Italian at all, but an “Iberian.” A few steps removed from being related to Emperor Titus, Trajan made his mark as a successful officer in the Roman army. By the year 91 Trajan had been appointed a Consul, and married shortly after, although his marriage never produced children. Trajan has been rumored to be homosexual, perhaps in part due to his lack of offspring, but with several references to his proclivities in that area it seems fairly likely that Trajan was either homosexual or leaned that way. Marble bust of Hadrian at the Palazzo dei Conservatori, Capitoline Museums. Trajan was shrewd enough as a politician to ensure support for his reign among the army prior to traveling to Rome upon ascension to the throne, and he wisely cultivated support among the common folk by distributing money, while also courting the Senate with a nod to their preferences. Although more or less an absolute monarch, Trajan was diplomatic and seemed tactful and considerate instead of imperious and cocky. This combination of ruling methods served him well, enabling him to advance his agenda. By the year 105 the Senate had bestowed upon him the title “Optimus princeps,” or optimal ruler (best ruler), and that title began appearing on Roman coinage. If there is any failure worth noting in Trajan’s reign, it would be the difficulty in keeping the Greek portion of the empire in line with Roman direction. Trajan became ill in 117 and his health declined over the months until he died of edema and/or a stroke in August of 117. 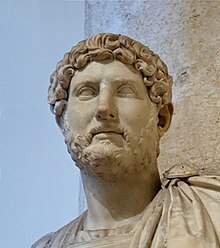 Hadrian succeeded Trajan, perhaps with the help of Trajan’s wife. In the 2000 years since Trajan’s death, his reputation and legacy remain intact, a rare feat of history indeed. As stated above, he joins Nerva, Hadrian, Anoninius Pius, and Marcus Aurelius as the second of the Five Good Emperors, a phrase invented by Niccolo Machiavelli in 1503 (yes, that Machiavelli!). The reign of these five emperors is considered by historians to responsible and wise, although authoritarian. Do you have a favorite Roman emperor? If so, tell us which one and why you think he is the best. Grant, Michael. The Roman Emperors: A Biographical Guide to the Rulers of Imperial Rome, 31 B.C. – A.D. 476. Barnes & Noble, 1997. Previous ArticleJanuary 26, 1965: What Language Do They Speak in India? Next Article A Timeline of Ancient Greece!